Business goes haywire for Charlize Theron and Joel Edgerton in the brand new trailer for Amazon Studios' Gringo. The movie, which is described as an "exhilarating mix of dark comedy, white-knuckle action, and dramatic intrigue," features David Oyelowo as Harold Soyinka, a mild-mannered businessman who finds himself in trouble in Mexico as he is hunted by his back-stabbing business colleagues back home, local drug lords, and a morally conflicted black-ops mercenary. Gringo is directed by Nash Edgerton with the screenplay by Anthony Tambakis and also stars Amanda Seyfried and Thandie Newton. 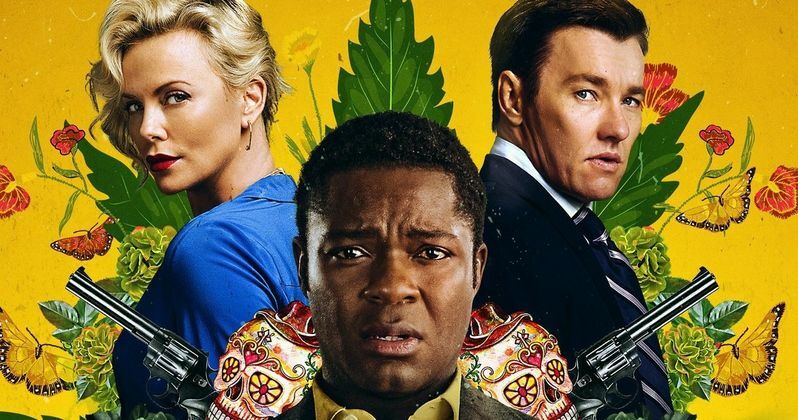 The trailer for Gringo starts off with Charlize Theron's Elaine Markinson and Joel Edgerton's Richard Rusk trying to sell a new marijuana pill to two reluctant businessmen (Alan Ruck and Kenneth Choi). Next some comedy elements come into play about male genitalia and walking on the moon first with Buzz Aldrin and Neil Armstrong. Elaine and Richard sell the pill and end up recruiting David Oyelowo's Harold to take the formula down to Mexico. Harold's out of his element and ends up being kidnapped by a Mexican drug mafia. Gringo certainly looks like the dark comedy it has been described as and looks well worth the wait, since it doesn't come out until March 9th. 2018. While the movie certainly looks funny and the performances look great, including David Oyelowo in a role that he's never done before, it looks like Amazon's marketing team just spoiled the best parts of the movie for everybody, which is a common practice for movie studios to pull off these days. However, they may not be the case at all and it might have way more going on that what we just saw in the brief NSFW Redband trailer. The official synopsis for the movie goes into a little bit more of detail, which leads one to believe that Gringo might have some more tricks up its sleeve than what we're seeing in the trailer. The official trailer synopsis reads. "Combining dark comedy with dramatic intrigue, Gringo joyrides across the border into Mexico, where all is not as it seems for mild-mannered American businessman Harold Soyinka (David Oyelowo). Crossing the line from citizen to criminal, Harold tangles with duplicitous business partners, Mexican drug lords, international mercenaries, and the DEA. As he attempts to survive in one of the most dangerous places on earth, the question lingers: is this ordinary man in way over his head, or is he two steps ahead?" It really looks like David Oyelowo's character is caught up in a world that he probably never even knew existed. But he might have it all figured out, but that will remain a mystery until March. As previously noted, Gringo is directed by Nash Edgerton, who made his feature length directorial debut with the acclaimed Australian thriller The Square. Gringo also stars Joel Edgerton (Nash's brother), Amanda Seyfried, Charlize Theron, Yul Vazquez, Thandie Newton, and Sharlto Copley. Financed by Amazon Studios, the movie is written by Anthony Tambakis and Matthew Stone, and produced by Rebecca Yeldham, Nash Edgerton, Beth Kono, A.J. Dix, Charlize Theron and Anthony Tambakis. You can check out the NSFW trailer below, courtesy of Amazon Studios' YouTube account.